Allows virtually all NPCs to train you in multiple different skills and to different levels of proficiency, with the option to replace the vanilla leveling system with a purely training based system. Removed edit to lockpicking XP gain for compatibility reasons. Trainer analysis script optimized for faster run speeds. Adds MCM option that controls whether training payment gold goes to the trainers inventory (where you can pickpocket it back) or just disappears (so you can't). Added configurable cap for master trainers. Added MCM option to enable vanilla training system in parallel with Trainers Galore's system. "I've taught you everything I know" dialogue is now suppressed by default, training options will just disappear once the cap is reached. Virtually all NPCs are now trainers and can train you various levels of proficiency in multiple skills. There is no cap on how often you can train per level and you can optionally turn off vanilla skill leveling for a "training only" system. MCM allows players to adjust the cost of training as well as level caps for different trainers. 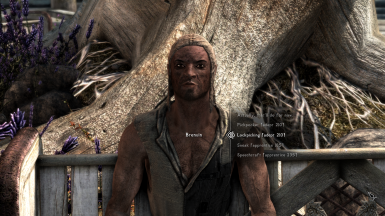 Uses existing dialogue for a seamless fit into vanilla Skyrim. 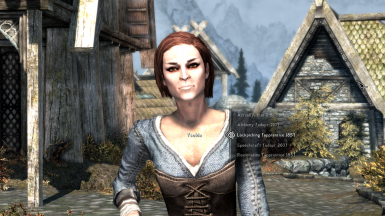 All humanoid NPCs with the following exceptions: NPCs with unique voices (like Delphine), children, and generic guards. In the first two cases this is because they lack the relevant lines of dialogue. In the latter case it was because guards are too numerous and it felt odd being able to ask them to train you. Though even NPCs who will train you won't do so if you are in a dangerous setting like a dungeon (including parts of the wilderness near dungeon entrances) or if you are trespassing. What can they train you in? NPCs can train you multiple skills, usually between 4 and 6. What skills they offer training in depends on their class. 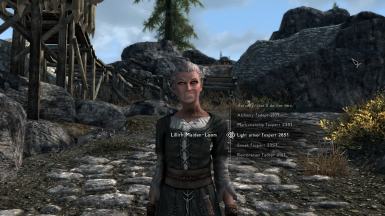 A few NPCs are placed in odd classes (e.g. 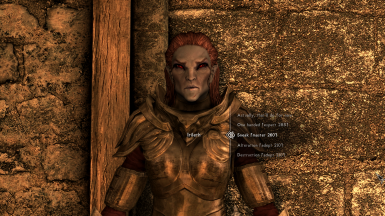 Aela the Huntress is considered a thief) and so in these cases I have assigned custom skills for them to train you in. When you ask an NPC to train you a notification will tell you what their class is to help you figure the system out (you can turn this notification off in the MCM if you don't want it). How often can they train you? As often as you want. Trainers Galore allows you to entirely replace the vanilla skill-increase-through-practice system with a skill-increase-through-training system and so there's no limit on how often you can train. To turn off the vanilla skill leveling system you'll need to use another mod (see installation section below). What level can they train you to? Trainer proficiency determines what level they can train you to and there are four different proficiencies of trainer: apprentice, adept, expert and master. These correspond to training limits of skill level 25, 50, 75 and 999, though these values can be configured in the MCM. Trainers have different proficiencies in the different skills they offer training in, so a master in one handed might only be adept in two handed. Farmers are pretty useless except for the skills that serve them in their daily lives. That said, their low proficiencies make them cheaper than higher level trainers (see below for more on cost). Skills: Block (master), one handed (expert), heavy armor (expert), two handed (adept), light armor (adept), archery (adept). Imperial soldiers are versatile and well trained, but with a focus on defensive skills. Skills: Conjuration (master), enchanting (expert), alteration (adept), destruction (adept). Conjurers excel at controlling magical forces and bending them to their will. proficiency - the proficiency of the trainer in that skill (apprentice=1, adept=2, expert=3, master=4). exp - the growth rate of training costs. Values >1 produce exponential growth, <1 produces logarithmic growth, =1 (the default) produces linear growth. Note that values other than 1 will make base, increment and surcharge harder to interpret. Linear growth in training cost from ~75g at level 1 to ~1100g at level 100. Total training cost from level 1 to level 100 is around 60,000g. If you're happy with linear growth of cost, you can simply change increment to make things a bit cheaper or more expensive. Training cost starts low (~60g at level one) and initially grows very slowly, but starting around level 50 it grows fast for much higher costs at high levels (~2600g at level 100). It's good if you always end up super rich at high levels. Total training cost from level 1 to 100 is around 80,000g. Training cost starts high (~300g) but doesn't grow that much as you level (~800g at level 100). The early game will be brutal, the late game easier. Total costs comparable to default configuration. I probably wouldn't recommend this setting. If you have a specific cost function in mind and are struggling to get it to work, let me know in the comments. Training is managed through a dialogue system. All NPCs that offer training have a new dialogue option requesting training ("I'm looking for training, can you help? I'll pay."). If you select this, you will be presented with a list of what skills they offer training in, their proficiency in that skill and how much training would cost (e.g. "Smithing [master 634]"). Once you select a skill to train in, you will lose the appropriate amount of gold and your skill will increase. A few notes though: (1) if you don't have enough gold the trainer will turn you down, (2) if your skill exceeds the trainers proficiency cap then that skill option simply won't be displayed anymore, and (3) by default the gold you spend does not go into the trainer's inventory to stop you bartering/stealing it back, you can turn this on in the MCM though. Most of the system is handled by standard dialogue options, but there's one mildly clever trick: when you ask for training a script runs that scans the NPC you are talking to to determine what training they offer and to what level. This script runs as the NPC is responding to your request (e.g. while they are saying "How much?") and it stores its results in a bunch of global variables that determine the dialogue options you are presented with once the NPC stops talking. 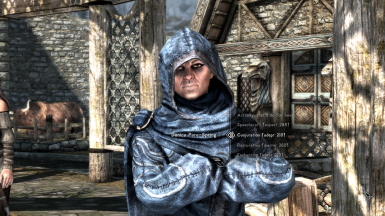 Using this script, as opposed to the usual dialogue conditions, allows the mod to be much more flexible and do things like have class determine training options for most NPCs, but not for a handful of specific NPCs that have been placed in odd classes. It also makes tweaking the mod much easier going forwards. - The cap sliders allow you to change the level to which different NPCs can continue to train you. Setting any of the caps to 0 will turn off those training options. - The cost sliders allow you to adjust the cost of training, as described in the "how much does training cost?" section above. - turn on/off the vanilla training system (it's off by default, but you can certainly have both). - control whether gold spent on training disappears or goes into the trainers inventory (it disappears by default). - control whether you're notified of the trainers class when you ask for training (on by default). - control whether you're told how long the config script takes (off by default, but its there for debugging). SkyUI if you want the MCM, but Trainers Galore will work with or without it. The Uncapper - Set all skill mults to 0, unfortunately this cannot turn off XP gain from breaking lockpicks, and some users report it periodically fails to load. 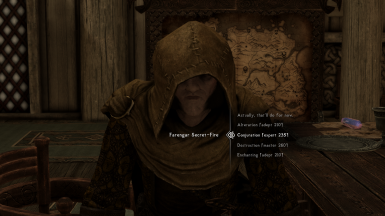 Experience Multipliers (SSE only) - provides an MCM that multiplies incoming XP, so set it to 0. Unfortunately it also affects XP from skill books. 1. Trainers Galore edits the vanilla training system to turn it off. If you have another mod that also edits this system then conflicts can arise and which ever mod is loaded last will win. If you want to keep the vanilla system on with the changes from the other mod, load that mod after trainers galore - you will get the effects of that mod, but will probably lose the ability to turn the vanilla training system on and off through trainers galore's MCM. If you don't care about losing the effects of the other mod, but want to turn the vanilla system on or off through trainers galore's MCM then load trainers galore after the other mod. 2. Trainers Galore uses NPCs classes to determine what skills NPCs can train you in. 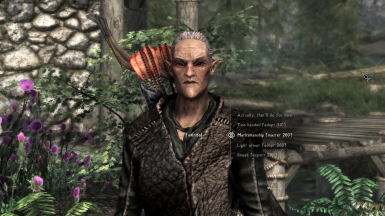 If a mod changes an NPCs class then the training they offer will change accordingly. If a mod adds new classes then Trainers Galore won't recognize them and that NPC will no longer offer training. The only mod I know of that does this is Immersive College of Winterhold and I have adjusted Trainers Galore to accommodate this. Trainers Galore works pretty much stand-alone, however, because it makes gold more useful than before it makes it more important to close any exploits that allow players to acquire gold unreasonably fast. For this reason I recommended using it alongside mods like Economy Overhaul and Speechcraft Improvements and Alchemy, Potions and Food Adjustments. The main issue outstanding is that there are probably more NPCs than I have spotted who are in weird classes and so will offer strange skills when asked for training. Fortunately, the script based approach makes fixing these discrepancies pretty easy, so if you see one let me know in the comments. Thanks to several r/skyrimmods users who gave feedback on a sketch of this mod. Thanks also to RogueRifler, the creator of Gold is XP, which inspired me to make this mod.